Lucy passed away on Monday. I have been so privileged to have been a part of her life. I know I have said it many times but Lucy taught me so much. No, the first year wasn’t easy. I was devastated when people were trying to convince me she was too difficult and that I should give her up. I am so glad I didn’t. She and I both had things to learn. She needed to trust me and I needed to accept her limitations and know that she was never going to be totally secure around other dogs. She was the softest, kindest dog . She only had that one problem….but don’t we all! She became so well trained and was always just my side kick. I had to know where she was at all times. She had to always be in my view. I had to be fully aware of our surroundings and plan our moves. Even in the house with people around I had to make sure doors weren’t opened….or doors were closed. Thus she became my shadow….attentive to what I wanted from her. She actually never walked out a door or gate without looking at me for permission. This all sounds difficult and time consuming but it became second nature to us both. She achieved instant recall so if she was in the yard and spotted a rabbit to chase, I could call and she would come to my side. She knew her muzzle was a good thing, brought fun times and was always accepting of putting it on. I am still in disbelief and shock that she is gone. There had been little things since after Christmas. Maybe it all started with the teeth grinding and chattering. We had two teeth pulled that may have been an issue but turned out were not. The grinding just mysteriously ended. I always thought it was environmental as we were living in a situation where many neighbours, including myself, were suffering from headaches, coughs etc. In January, she seemed to be not eating and was lethargic so we put her on a two week program of antibiotics. 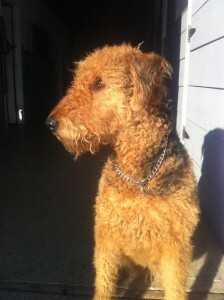 That seemed to do the trick and she was back to her goofy Airedale self. We went away for two weeks and when we got home on Monday, she was happy and bouncy, but earlier that day she had fallen over. After that she didn’t want to walk far, but other signs were all good….eating…..drinking…..no temperature.…pink gums and capillary refill time was great….bowels good. She still wanted to play….jump on the bed to sleep. Sunday night — her last night — she still had her dinner and her plate-licker specials. She slept in my room as always but didn’t get on the bed. She got up about three times during the night to change positions but stayed in the room. In the morning, I let her out and she did her business but then became disoriented so I helped her into the house and made a vet appointment. That was when I realized she was not going to make it. She went to her favorite place in the kitchen where she would sit and watch the cooking preparations in hope something would fall her way (and, of course, it always did). I lay down beside her for a little, and talked to her. Just as we were preparing to take her to the hospital, she left us. I don’t know why I was disturbing her to take her to the hospital. I knew she was dying and, actually, by that time, even though she had vital signs, she really wasn’t there. Among many other things, Lucy taught me that there are many ways to own a dog. She taught me not to believe everything you read or are told by trainers, to trust your own instincts, to do the things that work for you and your dog. I learned how important it was to work with the dog YOU have. Dogs do not always need other dogs for companionship. Dogs don’t need to walk in different places for variety; yes, it would be nice, but sometimes it’s not possible. We walked every day, one direction or the other, and she was just as excited and enthusiastic as the day before. I never became the calm owner when other dogs would try to approach. There were too many altercations when I didn’t know better that made me permanently nervous but I can’t believe Lucy didn’t understand that of me. I am convinced she knew how much I loved her….fought for her….protected her…and that is the important thing. Thank you for Lucy. Sending her to me turned out the way it should. I am so very sad right now but I know having her in my life was a good thing. Lucy was blessed to have you Michele and clearly it was mutual. Thank you for all you did for Lucy. She had a beautiful life with you and she’ll live in your heart forever. Thanks for sharing your story about Lucy. May the happy memories warm your heart whenever you think of her. 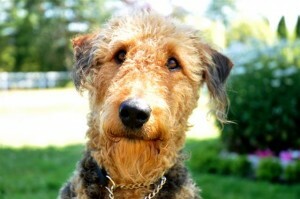 Yvonne from Airedale Rescue of Western New York. Lucy was a lucky lucky dog. Every dog deserves the unconditional love that you gave her. Your words are so full of gentle love and compassion and your story brought tears to my eyes. Your heart must be so heavy and sad right now but Lucy will remain nestled in a corner of your heart forever and gradually you will smile again knowing she is always with you in spirit. Sending hugs. I miss you already, Lucy. You “told” me to give you space; and though I sometimes forgot, I tried to do as you asked . Thanks for the Christmas treats you have given me over the years and for all the memories. We’ll meet one day on another kind of trail. Wags and Woofs, Kutter. Thank you for sharing your heartfelt story about your relationship and friendship with Lucy. You had a special bond and I am sorry for your loss. Please accept my sincere condolences. Thank you Michele for taking the chance on Lucy and sticking with it. Deepest condolences on the loss of your best friend. May your sadness and pain turn to thoughtful and even joyfilled memories of the time you shared. what an awesome tribute to a very special girl. May you find peace and comfort in all your happy times of life with Lucy. You were both lucky to have each other. What a beautiful love story Michele and know that true love as no end. We’ll be watching for Lucy’s bright Star! May God grant you strength and peace during this sad time! Michele, I thank you for your beautifully expressed understanding of a very special girl. Too often we are persuaded that the rules are to be stuck to; that what works for one must work for all, and no deviation permitted. Yet surely as humans we recognise the immense differences that make each of us unique, and we expect those differences to be readily accepted by others. As dog owners, our primary responsibility to them must surely be to also recognise their individuality and tailor our expectations accordingly. I love that you read Lucy so well, and gave her such security that you could read each other’s mind and body language in an instant. Travel safely Lucy, till you and your beloved Mommy meet again, and once more dance to the same tunes. Thank you to everyone for the love and support you have shared with me since Lucy passed away. I cannot express how helpful, reading your words were. Lucy came to me when she was 18 months and died shortly after her 6th birthday. Our time together was short but it was intense. Many of you who have shared their lives with dogs and animals that require special attention understand that extra bond that develops. Our love of animals brings great joy but it also brings heartache. I know not one of us would change having had pets in our lives. Someone said, and it is so true……their paw prints will be in our hearts forever.